SearchTorrance CA real estate, homes for sale and Torrance home prices and values. Find Torrance real estate listings, Torrance REALTORS®, open houses and foreclosures, and search the South Bay MLS. We also have information on selling your home in El Segundo and provide a free comparative market analysis. Our free real estate services feature all Torrance neighborhoods including Southwood, Victornia Knolls, Walteria, Old Torrance, Hollywood Rivera, Redondo Beach and more. Welcome to the gated communities and complexes of Plaza Del Amo. Conveniently located in the heart of beautiful Torrance CA, these wonderful communities offer an ideal housing solution for many home buyers. Plaza Del Amo is a street (actually two distinct streets) that range from Madrona to Crenshaw and then pick up a few blocks away from Torrance Blvd to Border Ave. 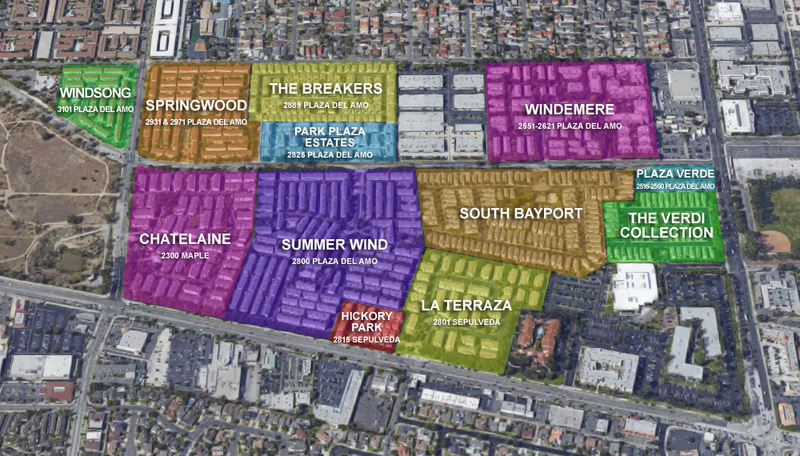 The bulk of the complexes that make up Plaza Del Amo are centered around the Madrona to Crenshaw section but not all street addresses are actually Plaza . The housing options vary from condominium units, to townhouses, to detached three and four bedroom single family style homes. Although some of the complexes have street addresses not on Plaza Del Amo the community in general is known by this name. Home prices in Plaza Del Amo generally range between the low $400,000s for a 1 bedroom condo in Windemere to over $900,000 for a single family style home (fully detached) in some communities such as Hickory Park, the Breakers and Verdi Collection. What makes Plaza Del Amo so popular? Location: The communities are in the heart of the South Bay with an abundance of shopping, dining, and entertainment just blocks away. The communities are also located near freeway access, not far from LAX and just a short drive to the beach. Simplicity: As the HOAs and property management companies take care of much of the landscaping, exterior maintenance and the pool and spa (for some of the communities). It's ideal for those that travel or those not wanting to deal with the maintenance and upkeep of single family homes. Schools: Torrance schools are highly ranked and the Torrance Unified district has award winning elementary, middle and high schools.